. . . . . . . .. . . . . . .(name of place & location) . . . . . . . . . . . . . .. . . . . . . . . . . . . . . .
on . . . . . . . . . (day & date). . . . . . . . . . . .,from ..... . . . . . . (time) .. .. . . . .. . . . . . . .
at . . . . . . . . . (telephone# & time available for calls) .. . . . . . . . . . . . . . . . . . . . . . . .
A sidewalk minstrel from Boston with over two decades of performances, Stephen Baird, enchants young and old alike with wonderful stories, poems, jokes, and plenty of songs. 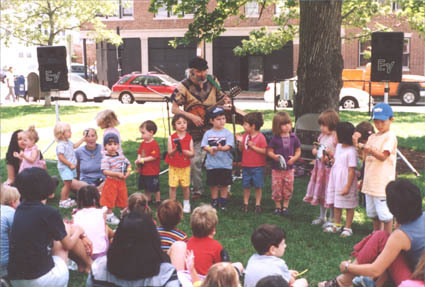 His repertoire is seemingly endless, ranging from Irish ditties to rag-time to sing-alongs. With leprechaun charm, he accompanies himself on all manner of instruments; guitar, mandolin, banjo, dulcimer, autoharp, kazoo, puppets, costumes, tambourine, and the fascinating limberjack - a percussion instrument in the form of a wooden puppet toy. Stephen Baird makes a place where people meet and touch each other through art and music. 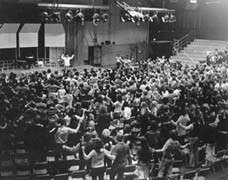 Stephen Baird has toured forty-two states, Canada and Europe, playing on street corners, at fairs, festivals, concerts, coffeehouses and over one hundred college campuses since 1971. 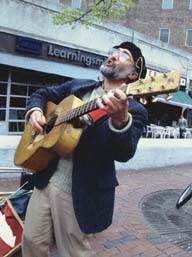 Instrumental in legalizing street performing in Boston in 1973, he has since become nationally renowned as an advocate of street performing and folk music. Stephen Baird restructured Club Passim, the historic folk music venue in Cambridge, as a nonprofit organization in 1995-1997, co-founded the Bread & Roses Festival in Lawrence in 1986, founded the Folk Arts Network in 1982, published the New England Folk Almanac and New England Folk Directory from 1982-1996, produced Jamaica Plain Open Studios as the Executive Director of the Jamaica Plain Arts Council from 1999-2001, and founded the Community Arts Advocates in 2002. He has been featured in Time, Newsweek and People Magazines, American Bar Association Journal, a PBS-TV documentary "Street Singer," a Discovery Odyssey Television Special "America" and at the Kennedy Center for the Performing Arts in Washington, D.C.
"Small, elfish, with remarkable energy and street presence, Baird has an enormous repertoire...crowds inevitably gather around him and he possesses the uncanny ability to turn an otherwise rational crowd of adults into a hand-clapping, singing, foot-stomping, head-nodding mass." "Whether he's playing a dulcimer solo of a theme from Beethoven or leading the chorus of the foot-stomping ragtime blues, his joy and energy ripple out through the audience like the frequent laughter and applause."